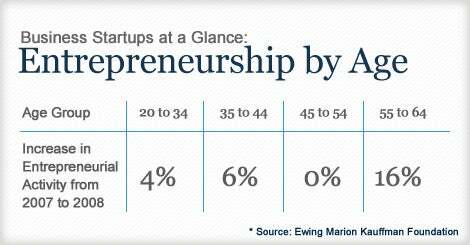 Entrepreneurs in their 50s and 60s are becoming business owners faster than any other group. Norma Davis was 55 when she opened an indoor children's gym that specializes in bounce houses and birthday parties. John Olson spent 11 years working his way up in grocery store management before quitting to turn his hobby making backyard fountains into a retail business. Jayne Dearborn was a hospital dietitian turned stay-at-home mom when a family tragedy prompted her to switch gears and start a designer handbag business. If it seems as though stories about middle-aged entrepreneurs like Davis, Olson and Dearborn are popping up everywhere, it's because they are. Younger entrepreneurs may hog the spotlight, but baby boomers are becoming business owners faster than anyone. From 2007 to 2008--the latest data available--new businesses launched by 55- to 64-year-olds grew 16 percent, faster than any other group, according to the Ewing Marion Kauffman Foundation, a nonprofit group that studies U.S. business startups. All told, boomers in that age group started approximately 10,000 new businesses a month. The trend is so strong that the Kauffman Foundation predicts a sustained entrepreneurship boom, not in spite of the country's aging workforce, but because of it. Other researchers agree. "The older you are, the more likely you are to be self-employed or a small-business owner. I don't think it's new, but I do think it's growing," says Edward Rogoff, the Lawrence N. Field Professor of Entrepreneurship at Baruch College in New York. "Older people need to make more money than they did before and their chances of finding traditional employment are restricted, so more of them get pushed into entrepreneurship. Or they just find it attractive." As entrepreneurs, people in their 40s, 50s and older have a lot going for them, including a career's worth of accumulated knowledge about an industry and a network of people to tap as financiers, suppliers or customers. Recession or not, they're also more likely to have retirement or other savings to fund a new venture. Nobody says it's easy. Older entrepreneurs face obstacles their younger counterparts needn't worry about -- especially time. 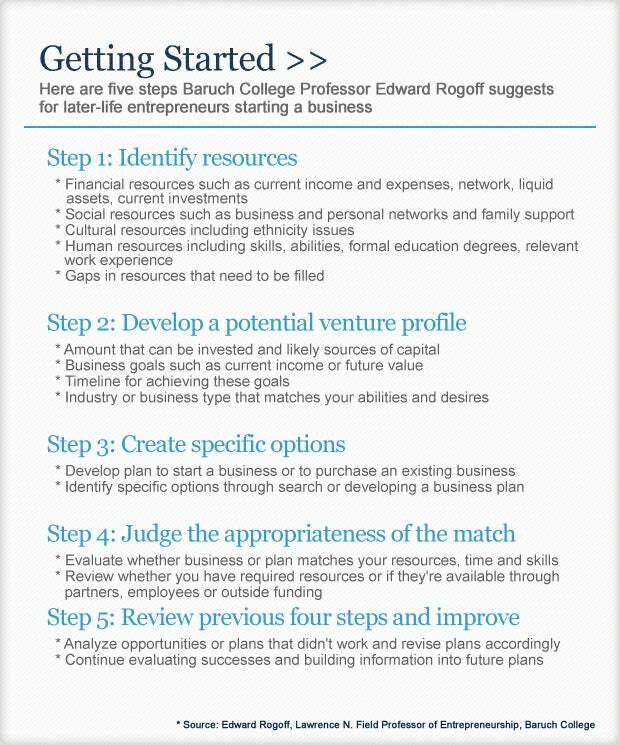 If you're starting a business as a way to supplement your income, you can't wait the typical five years or more that younger entrepreneurs are told to expect before turning a profit, says Rogoff, co-author of a new book on the subject, The Second Chance Revolution: Becoming Your Own Boss After 50. And if you're older, you can't afford to bet the ranch on a new venture and lose because you don't have the time to earn that money back again before retiring, he says. Mature entrepreneurs are more likely to have family needs to consider when weighing the sacrifices necessary to make a new business work, says Melinda Emerson, a small-business coach and author of the book Become Your Own Boss in 12 Months. You'll need to get your whole family's buy-in, Emerson says, "because scaling back everyone's lifestyle is a tough order, but it's what it takes." Nevertheless, later-life entrepreneurs who prepare for the rigors of startup life can enjoy rewarding outcomes. When Norma Davis retired from a 27-year career at Verizon, she knew she wanted to run her own business and took time to investigate the possibilities. One day while babysitting grandson Prestin, she took him to a birthday party at an indoor gym. "I held him in my arms and walked around and said to myself 'This is it.'" But getting from inspiration to grand opening of her PNP Family Play Center in the Philadelphia suburb of Lansdowne took a solid year. Davis researched locations, and when she couldn't find an existing one, she leased an empty lot and drew up blueprints for a building tall enough to house an 18-foot-high slide and other inflatable play structures. She also bought commercial time on the local cable TV channel, built a website, and got first-aid and CPR certifications--funding everything from retirement savings. One year after PNP's grand opening, Davis spends four days a week running the center when it's open and the other three cleaning it. She has 10 employees, including several family members, but doesn't expect anyone to share her passion. "No one's going to treat it like it's their business but me," she says. The recession put a damper on business last summer, but Davis expects to turn a profit next year. Meanwhile, she couldn't be happier. "You're on your toes and you're constantly thinking, but it's a fun job. Your reward is seeing the children's eyes light up when they walk in the door." Some later-life entrepreneurs turn a hobby into a second career. John Olson carved table-top fountains out of gray lava rock in his spare time while working as an assistant manager at the Publix grocery chain. When a corporate restructuring reduced his salary, Olson took early retirement and began marketing his fountains to garden centers in earnest, cramming parts into spare corners of his Sunrise, Florida, home. Soon Olson expanded his offerings, moved his business online and hired outside contractors to manage the warehouse, orders and customer service. Olson, 45, credits his success to lessons learned in the grocery business, where his duties included helping store managers streamline processes to bring costs down and profits up. Those efficiencies helped his company thrive as the recession pushed some competitors out of business. In September 2009, Olson bought a former executive retreat in the Smoky Mountain foothills 90 minutes outside Atlanta that now serves as his family's home, as well as the headquarters for his company, GrayStone Industries, and a second warehouse. A retail fountain shop is in the works. This year, Olson expects his onetime hobby to generate sales of $2 million. His only regret is not starting sooner. "I thought you had to be some kind of Harvard Business School graduate," to form a company, he says. "But I realized you just have to apply basic business principles." It's common for later-life entrepreneurs to start a business to reconnect with a former passion or to make a difference. Jayne Dearborn did both. After Dearborn's 7-year-old son, Max, died of childhood acute myelogenous leukemia (AML), the former dietitian and West Linn, Ore., resident, turned to a long-buried love of art to heal. She started making fabric handbags and giving them to friends. Next came sales at trunk shows, and now her company, JayneMax, sells fabric and leather purses to 20 boutiques across the country. Her creations have appeared in magazines and on TV's Ugly Betty. Demand outstripped Dearborn's ability to do everything herself, so she outsourced manufacturing to China and turned over sales to her husband, Chris, who retired from his high-tech job in 2008 to help run the business. Part of Dearborn's impetus for starting a company was to raise money for Max's Blue Butterfly, a nonprofit she established in 2009. Since then, she's collected $10,000 and is organizing the foundation's first major fundraiser for Cincinnati Children's Hospital's research into childhood AML. "Handbags were fun, and I could see it growing into a business for us," Dearborn says. "But it wasn't enough for me. I felt like I needed this other component where I could give back in a bigger way."